You Don't Have to Be an Angry Mom. How to Fix It Quickly. So I trudged up the stairs for the last time of the night, hopefully. I opened the door to her room and stepped on something squishy. I bent over to pick it up. Wilbur the pig. She’s had this pig since she was a baby, she insists Wilbur is a girl just like her, and it goes with her everywhere. Many a freakout have happened when Wilbur couldn’t be located in time for bedtime, or leaving for the airport, or before sitting down to watch Charlotte’s Web again. “Because she’s ruined now. She has markers all over her.” It was dark, but I could hear the grief in her voice. “Oh,” I said, bending down next to the bed. She held out her arms, and I tucked Wilbur in under her chin. Then we were quiet for a few seconds while I played with her hair. A sudden lump in my throat made it impossible to speak, so I just hugged her for a while. As it turns out, that 14th trip up the stairs was the charm for Bailey…and for me. 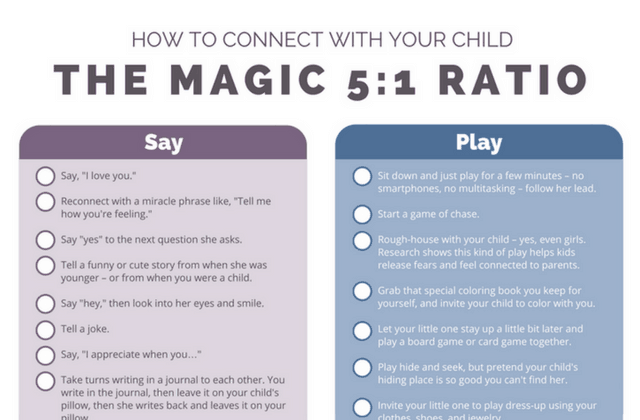 After a negative interaction, you feel the distance between you and your child, but it’s not always easy to know how to close the gap with your child so you both feel loved and connected. 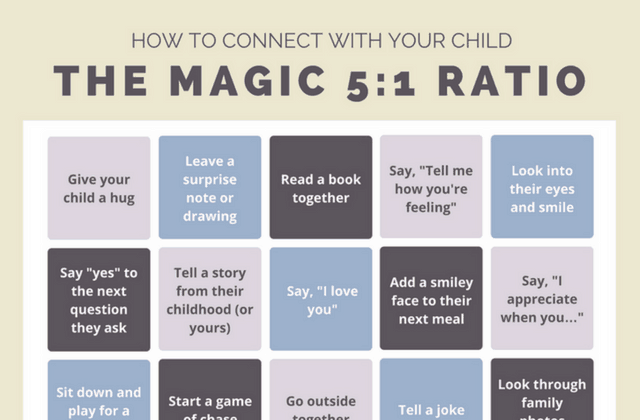 Use this cheat sheet to help you bond with your child after those tough moments so you can “earn” back a hair tie. For the one that looks like a bingo board on steroids, you can cut out each square and put them in a jar. Then when you need an idea for connecting with your kid, pull out a random idea and do it. Or leave the whole thing intact and pretend you’re playing blackout bingo to see how many you can mark off over the course of a week. With the list version, you can use the sections to help you try out a variety of ideas. Personally, I tend to rely heavily on words of connection, and I forget the more physical acts of connection. This version of the cheat sheet helps me remember to mix it up. After my family welcomed our third little one into the mix, we became a family of five with a second-grader, a toddler, and a newborn. Even though I could have used more sleep and way more coffee, we were happy. Then my husband’s paternity leave ended, and I was at home with the kids all day. As time wore on, my patience became razor thin. And one day, I just broke. The shame burns my cheeks just thinking of that day, even now. But thanks to that experience, I realized I had to make a change. I threw myself into researching how to find happiness in the chaos of parenting. Something beyond “make time for you” and “exercise more.” Because when you’re overwhelmed and at your breaking point, you don’t need the “experts” telling you more stuff to do on top of everything else. That’s how I discovered the secrets: 10 secrets every parent should know about being happy. After hearing from hundreds of parents in the same boat as me, I knew I needed to share what I discovered. And so I wrote a book: Happy You, Happy Family. 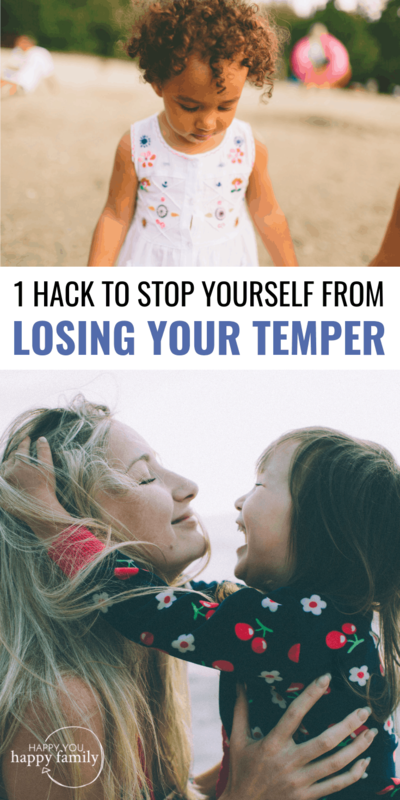 In the book, you get a Temper-Taming Toolkit with simple hacks like this to help you keep your cool during those everyday parenting moments that test your patience. 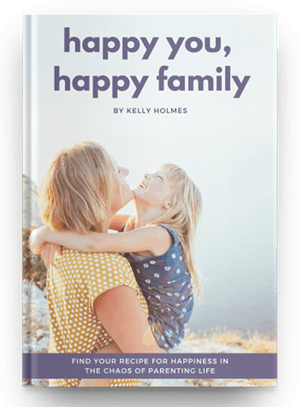 Click here to get your copy plus a bonus workbook and start your journey towards finding more happiness as a parent. Because the truth is that happiness won’t come from a big promotion at work, or from winning the lottery, or from your kids all learning to put their toys away when they’re done playing. Because eventually, you just get used to all that stuff. True, lasting happiness comes from a conscious effort by you to put the right habits in place. What helps you get back on track when you’re feeling like an angry mother? Share in a comment below! Your posts are always so spot on with what I need to hear! I wish I could print them out and share them with my husband (he’d never read a blog) but when I try to print from your site I end up with 20 pages with images and spacing stretching everything out, then all the comments at the end. There are lots of add-ons you can toss into your site to make easily printable version of your posts. Please consider adding one!! Thanks! Thanks for this post. I quite often ‘fly solo’ at bath time, at weekends, due to my husband’s work and other commitments. I’m interested to see if this works for me, especially during pms weeks when my anger really flares. I have the same issue during the evening and night time hours. I am pretty calm and collected during the daytime, but when it is time my bedtime and my son decides to wake up that’s when my patience is gone. It is hard to keep a level and clear head when your woken up during the night and are all groggy then have to deal with a fussy child. I hope these tips help. Glad to hear it resonated, Kendra :) Enjoy your hair tie shopping! Just to add to get sharpee off stuffed toys saturate the spot w/ rubbing alcohol. Then wash in washing machine or sink. ? Same w/ the carpet. Blot w/ paper towels. We had a similar incident. It works on plastic toys also. My 2 year old got a hold of a sharpee and drew on EVERYTHING!! Lol oh boy. I was just glad to get it off my laminate wood floors. (1 cup each: clear vinegar, blue dawn dish soap and hot water.) scrub down w/ a magic eraser. Thank you, Jessie! I Googled right after it happened so I used rubbing alcohol on the stuffed animals then threw them in the wash, but it didn’t work for us. Does rubbing alcohol “go bad” maybe? We’ve had our bottle a while. But hopefully your comment will help someone in the same situation! I’ve used hand sanitizer with sharpie on stuffed animals with great results! Alcohol comes in different strengths: 50%, 70% and 90%. The 90% works best for ink or sharpie. If you have residual grey sometimes bleach /borax/laundry detergent brushed with an old tooth-brush. Will remove- but as u know- gotta be careful with bleach! Jennifer, I’m so glad this found you at the exact right time that you needed it! I can definitely relate to that guilt over getting frustrated with small things. But after using this trick to get my tone in check, I feel closer than ever to my preschooler. Hoping this brings you the same gift. <3 Happy Mother's Day! Reading this has me in tears…..of joy, that is. Knowing that Love Always Wins, it’s still hard as an exhausted momma to know how to fight the battles. But this. THIS gives hope! Thank you for sharing this and the sweetness of your little triumphs. Definitely planning on putting those hair ties to the test. Thank you so much for this! I know I’ve had much less patience with my 3-year-old after the arrival of our newborn, but I haven’t known what to do (or what I can do) to help “fix” me. I stumbled across this post on Pinterest and this is exactly what I needed! I’m optimistic this will help improve the situation; I love my firstborn so very much and I want my words and attitude towards him to reflect that. Hi I love the idea of the visual cues. However I hate anything on my wrist, and my husband won’t wear hair ties or bracelets. Do you have any suggestions for 5 alternatives we could possibly use? What about clothespins or safety pins on some part of your clothes? Move to the other side? Might work better for home than out and about, but it seems like the process would be the same. Thank you! Totally starting this in the morning. Love, a mom who really needed to hear these words tonight. ? omg the way you talk in that first paragraph has been my entire parenthood experience! my kids are horrible at 11 and 8. huh. Hi, I am a mother of a toddler and a 4 month old. My husband works out of town most of the week every week. By the evening every day I am usually crying over a combination of guilt, being overwhelmed, toddler whining etc. I am looking forward to trying out this method. Lately I have felt so much shame in the less than prefect mother I have become. Thank you so much for sharing this! I really hope it works for ne too! Thank you so much for your post, Though I do not have kids, I struggle in my personal relationship. PTSD has unfortunately made me into someone I do not want to be and I often find myself snapping at people I love. I finally found someone with so much patience and love despite my own flaws, but I want to treat him with the same kindness and respect he gives me. I plan to give this method a try for this! This method could be used as treatment for so many different life struggles! Wow this is just so good! I have never heard of using hair ties, but I think it’s brilliant! Definitely gonna employ this. Thank you so much for sharing! I needed this thank you! also ypu can try rubbing alcohol to get off the sharpie it may take a few goes but should work! Im crying. THANK YOU. can’t wait to try this. As a mom to a 2 y/o and a 5 m/o my toddler ALWAYS gets all the anger and then I absolutely hate myself…. I can’t wait to try this! Thanks a lot for sharing. I so needed it.